Help Your Garage Lighting Plan?" Consider portable garage lighting for those hard to light areas when planning your overall garage lighting scheme. There are some great portable garage lighting units available that store-away easily when not in use that can be used indoors or outdoors. The unit shown at the left puts out 300 watts equivalent of light from one fluorescent bulb and can sit on the floor or workbench when in use. 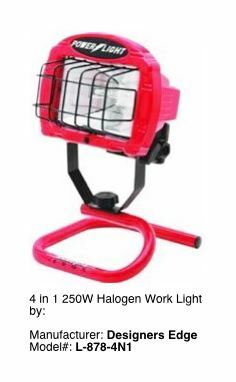 It is a great little grab-and-go high powered garage lighting unit that uses one (1) 45W fluorescent bulb. The unit weighs 11.5 pounds and comes with a 5' grounded power cord. This product has a five year limited warranty from the manufacturer. 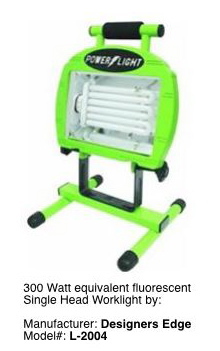 The unit shown below puts out 1200 watts of light from four (4) 300 watt halogen bulbs and has twin adjustable heads. 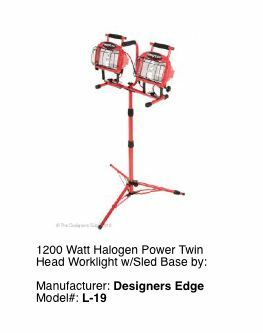 The sled base is detachable from the the tripod which extends up to 72" in height. The unit features two (2) weatherproof switches for on/off control and breaks-down easily for quick storage or portability. This garage lighting unit comes with and extra 300 watt bulb that stores in a extra bulb storage tube. The unit weighs 17.5 pounds assembled and measures 23" x 72" x 29.75" and features a 7' grounded power cord. This product has a five year limited warranty from the manufacturer. 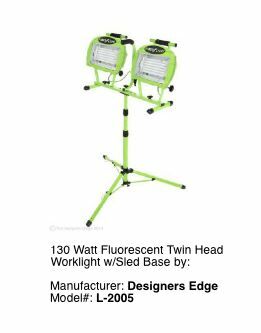 If you prefer fluorescent lighting the garage lighting unit shown below is an energy saving cool burning light that uses two (2) 65 watt fluorescent tubes that put out the equivalent of 600 watts of incandescent light. The sled base is detachable from the tripod which extends up to 76" in height. The fluorescent tubes will last up to five times as long as the halogen tubes. The tripod base is great for uneven surfaces and features one adjustable leg. The unit weighs 25 pounds and measures 32" x 76" x 29" and comes equipped with a 7' grounded power cord. This product has a limited lifetime warranty from the manufacturer. If you need a bright light for those very hard to reach places such as under the hood of your car, the unit shown below is ideal. This single lamp halogen bulb garage lighting unit puts out 250 watts of light right where you need it. This unit weighs 3.5 pounds and comes with a 5' grounded power cord. The unit includes a heavy-duty clamp, hanging hook, portable base, and yard stake. This unit meets ASTM specifications for water resistance. This product features a limited one year warranty from the manufacturer. It is UL and CUL listed. These little garage lighting units are indispensable when it comes to getting bright light into those hard to reach places in your garage or for working underneath a car or truck. The clamp allows you to attach it to the hood of your car or anywhere under the hood such as on your radiator housing. When your laying-out your garage lighting plan make sure you consider portable garage lighting. It is a great concept for those special lighting needs that arise every now and then.